The VCI molecules align on the surface of the metal to a depth of 3 to 5 molecules. This layer of molecules passivates the charged surface and creates a barrier that prevents oxidation. The corrosion cell (the flow of electrons in the metal and the flow of ions in the electrolytic surface layer) is unable to establish itself. The VCI molecules migrate into recesses and hard to reach areas on even the most complex shapes. The molecules build up on the metal surface until a continuous barrier has formed on the metal part. When metals are wrapped or packaged in VCI, the chemicals volatilize in the packaging environment, forming a protective molecular layer on the surface of the metal. This protective layer serves as a barrier, preventing moisture, salt, dirt, oxygen, and other corrosion causing materials from depositing directly on the metal and causing rust and corrosion. 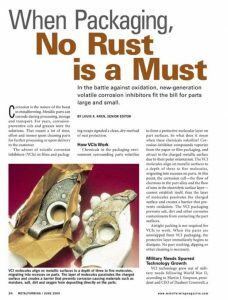 Have a corrosion problem? We can help you choose the right VCI to solve it. Just explain your situation in the form below.